Please be certain which style hat you are ordering. There are separate listings for 3 letter monogram, Mrs. hats, and custom lettering name/sayings hats. All are listed separately and have different pricing. All monograms must be approved by you before stitch out of your hat can be started. Please check your convo page for your design proof by next business day. All monograms must be approved before stitch out. Please review your design proof which will be posted on your convo page within 24 hours. Personalized with your 3 letter monogram. If a name or message is requested, please send convo for quote. This hat includes the ribbon hat band and bow as shown. Breast Cancer Hat Band Ribbon and/or solid pink hat band grosgrain ribbon. This hat is embroidered, not glued with sequins, etc. Very soft and floppy & crushable! Hat Band and Bows Included. I also have large pink flowers which are not included. I have flower samples listed all throughout my shop! Price WITH FLOWER IS $54.00. The bows and monogram can be worn on front, side or back. This sale is for the white hat but I do have other colors in stock ! Hat Band and Bow are removable and/or repositionable. This is one of my larger brimmed sun hats! Please send convo for multiple hats. We accept paypal and most credit cards. Shipping by Priority mail only with confirmation :) We ship to verified addresses only unless other arrangements are approved prior to shipping and purchase. So sorry, but I can only ship to continental USA. Will ship to APO ! All hats are custom, and therefore, no two are ever exactly alike. If ordering a Hat, please read the following. Please send all monogramming information at the time of sale through your Etsy convo page or seller instructions & check back often to view your design proof. 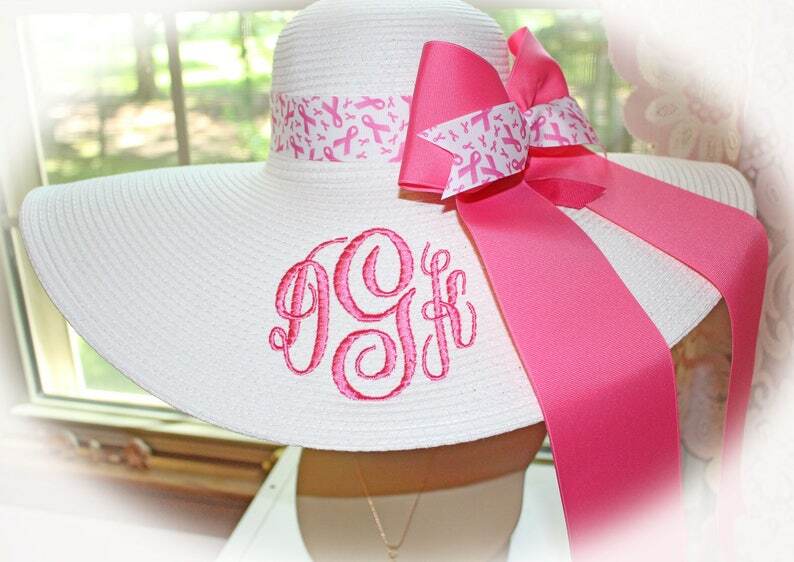 If no information is included, your hat will be monogrammed with the same colors, font style, etc. as the sample hat picture shown. Personalized Baby photo Shoot Hats for your Photo Props, Vacation, Beach, Baby Shower All Embroidered and Customized ! LOVE LOVE LOVE! Perfect for my honeymoon!! Bought this for my best friends honeymoon... super friendly service and speedy fast! The new bride loved the hat! I would definitely recommend and buy again :) thank you for such wonderful customer service! Absolutely 100% love my hat! I ordered this for my honeymoon in coming up in June. Very professionally done. The sewing work is top notch. I would order again. We now accept most major credit cards with direct check out. We still accept paypal, too on a case by case basis having a verified and confirmed account only. So Sorry, but I do not accept checks or money orders at this time. All purchasers must have a "VERIFIED" shipping address attached to their paypal or credit card accounts. If your account is not verified, you must provide Paypal or your credit card company with the necessary information to "verify" your name, address and payment method before an item is shipped. Paypal notifies us when/if your account has been "verified". Please make all payments within 3 days or item may be subject to relisting. I am sorry, but non payment for purchased items will be reported to Etsy and the sale will be cancelled. Thank You. So sorry, but hats are not refundable nor returnable. They are considered a "worn" item once they are shipped to the customer. My items are custom and mostly one of a kind and are therefore, non-returnable. Please check your spellings & thread colors & designs before ordering :))) Stitching cannot be removed once sewn. If requested, we will send you a preliminary design picture for your approval. We want to make you happy! Once a hat is sewn, stitching cannot be removed. All Hats whether custom or plain are non refundable and non returnable for several reasons. First, once they are worn, they cannot be worn by another person for sanitary & health reasons. Also, once a Hat is embroidered, the stitching cannot be removed. Please understand that once you order your hat, sewn and/or it is shipped out to you, it is yours to keep. My items come from a smoke free and pet free home, therefore, cloth items cannot be returned because I then cannot guarantee that my fabrics/items are still pet and smoke free. I will place orders in line for stitch outs by the date they are ordered. If you do not provide me with all of the required embroidery instructions, your item may be delayed. Please send your monogram instructions along with your payment and/or purchase. If additional custom work or designing is required, additional time may be required for shipping. If you request a preliminary design picture, I cannot sew or begin your stitch out until I hear from you! I always post your designs within 24 hours or of your purchase right here in your Etsy convo page ! Design work is not provided prior to sale. Bows and Flowers: Pictures show samples sold. Bows and Flowers are handmade and therefore, will and may differ slightly. You may still choose your preferred colors, however, flowers and bows will be made with in stock supplies. Please state your preferences when ordering. Your item will be similar, but not exact. Monograms, proofs, and design work are not offered prior to the sale. We have many, many samples and pictures to help you choose your fonts. After your sale is complete, we are happy to offer our design services to ensure that you receive the monogram you would like. We don't give up until you are happy! Please realize that when hats are made, they have ridges, bumps and veins. Stitching is therefore not on a smooth surface. You may see the ridge peep between the stitches. This may occur if a monogram thread is chosen with a light color stitched upon a darker colored hat. I will do my best to minimize any bleed through, however, at times, the hat ridges are just too high to completely hide within thread. We try to ship within one week after you have approved your design if the item is in stock! Thank You! Monogrammed Floppy Hats Navy & White Stripe. Bride, Kentrucky Derby, Carolina Cup, Beach, Honeymoon, Wedding CUSTOMIZED !